The large number of video file formats and their limitations are often the source of much frustration for those who work with them a lot. Among them are MOV files that are created mostly by Apple products. And it’s no surprise that they don’t gel well with other operating systems. So, if you’re someone who owns an Android phone, you’ll have to convert those files to the MP4 format. This is where a program like Wondershare Video Converter Ultimate will come in handy. The best thing about this software is the ease with which it lets you achieve your goal. 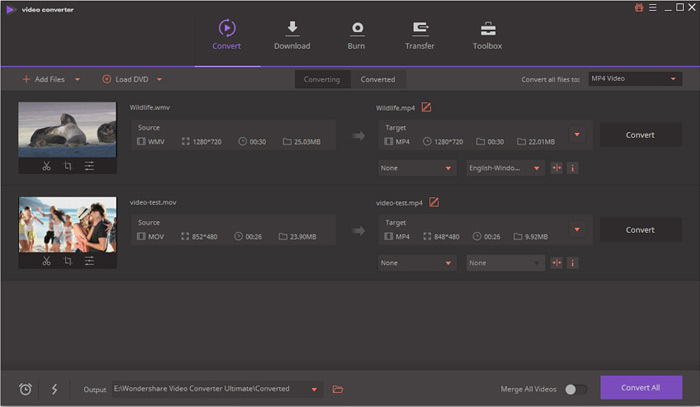 Once launched, a clean and simple interface will greet you, directing you to add the MOV file that you need to get converted. Once added, all the necessary details regarding this file are shown to you along with the characteristics of the file that it will get converted into. This program will set the target file to MP4 (same resolution) by default, but you can change it by clicking on the dropdown menu on the right hand side. Here, a variety of other file formats like MKV, AVI, WMV and more are at your disposal. Once you’ve made your choice, just clicking the Convert button will convert MOV to MP4 for you. But there’s tons other stuff you can do before you hit the Convert button. For one, you can change the resolution of the output file using the dropdown menu. So, if your MOV file happens to have a 4K resolution which takes up too much space, you can convert it into a 1080p MP4 video. Plenty of presets are available in this menu as well, but you can even customize the finer details according to your liking. A sub-menu also has presets aimed at converting files to work with specific devices like those from Samsung, Sony, LG and more. And if you wish to have your video edited before converting it, there’s scope that as well. Towards the left side of the interface, the files added by you get three tiny icons for serving this purpose. 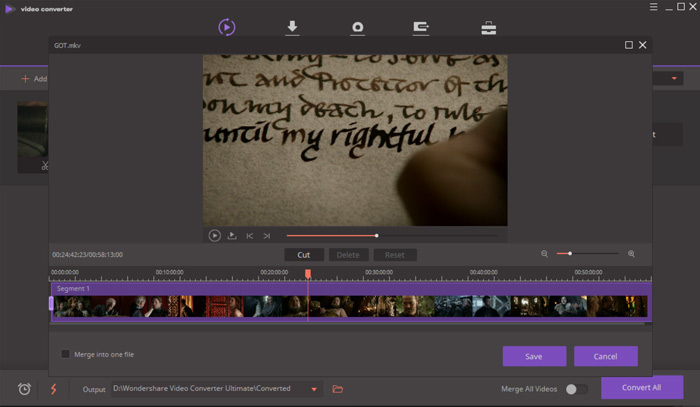 One among them lets you trim the video to cut out the unwanted bits, while the other option lets you crop or rotate it, or change its aspect ratio. The third icon is meant for adding video effects, subtitles, watermarks and more. This menu lets you alter the brightness and contrast of your video, while it also allows you to add filters to make them look better. Wondershare Video Converter Ultimate even holds the ability to convert multiple videos at a time. All you need to do is import all the files you need converted, set their output parameters, and hit the Convert button. Another highlight of this software is its High Speed Conversion mode. This option uses the APEXTRANS technology in order to deliver 30x faster conversion speeds. However, it is only applicable for a select few video formats. But don’t worry, as MOV and MP4 are indeed supported by it. The versatility of this software doesn’t stop there. It’s got a host of other useful features under its belt. These include the ability to quickly download online videos. This means those who frequently use YouTube videos in their work will find a lot of utility in this tool. A full-fledged DVD burner also exists in this program, apart from a screen recorder, A GIF maker, a VR converter and a video compressor, which can be used to reduce the size of your video files. Wondershare also has a free MP4 to MOV online converter option that can be accessed through your browser. Files less than 100MB can be converted by this online program with the same speed as the Windows and Mac versions. The trial version of Wondershare Video Converter Ultimate can be downloaded for free, but its limited nature can be overcome purchasing the full version.